The arrival of ebooks completely revolutionized the way we read, making it possible to take large numbers of books on our travels without exceeding our luggage allowance. The availability of free books has also made it easier than ever to try out new titles – whether they are classics or something more contemporary. 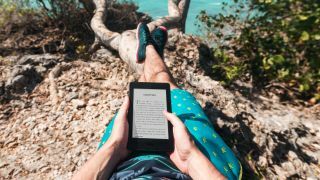 Having changed the face of online shopping for physical products, Amazon managed to do the same for ebooks with its Kindle hardware and marketplace. Making it as easy to buy a digital version of a book as it is to buy a digital version of an album, Amazon has done a great deal to make books accessible to more people. But money can still be an obstacle – and that's precisely why we've tracked down some of the best free titles you can download right now. Get ready to settle in for a nice long read – Just One Damned Thing After Another is not a stand-alone book, but the start of the The Chronicles of St Mary's series. There are eight books in the series, and it's worth checking out the short story The Very First Damned Thing, which preceded it, as it helps to set the scene and gives a lot of helpful background information. While the author is very keen to stress that her books aren't about time travel, the story involves modern day "disaster-prone historians who investigate major historical events in contemporary time". Protagonist Madeleine Maxwell explores and observes past events, taking care not to interfere with what happens. The result is an intriguing and often hilarious tale that achieves what many people would imagine to be very tricky – making history absolutely fascinating and endlessly entertaining. F Scott Fitzgerald's classic was written, and is set in the roaring twenties, and explores the decadence and emerging ideas of the time. Widely recognized as one of the finest English language novels of all time, The Great Gatsby is a beautifully-written piece of work that's almost Wildean of one-liners and quotability. The themes of romance, extravagance and aspiration are wrapped in truly beautiful language and it's a fascinating glimpse into a world that we will never have the chance to experience firsthand. The observations on society – particularly that of class – still have relevance today. Don't let the age nor 'classic' status of this book put you off; reading it is an absolute pleasure from start to finish. Short enough to race through in one sitting, the book is a classic there's not really an excuse not to have read – so what are you waiting for? If you're going to read free ebooks, why not go the whole hog and download an entire series at once? With Fallen Empire, Lindsay Buroker has created an impressive work of science fiction comprising three books – Star Nomad, Honors Flight and Starseers. In addition to the three main books, this omnibus edition includes the previously unpublished prequel Last Command, as well as the short story Starfall Station. Something of a slow-burner, the story of Alisa and the hunt for her daughter is an epic adventure with a twist of humour. Characters are strong and the development of relationships takes you on a beautiful journey across the course of the series. Politically and socially aware, Buroker has clearly been inspired not only by Star Wars, but also cult favourite Firefly. Her writing style is fast-paced but features gradually emerging themes and this set of titles serves as a great introduction to a sci-fi writer with an extensive library of books to her name. A staggering work of genius, The Prophet comprises 26 prose poems, written in the 1920s. While there are references to God and religious throughout the poems, it isn't an overtly religious text – it's a beautiful piece of writing that serves as a work of philosophy, and it's hard to imagine anyone being able to read it and not draw something from the text. Musings on love, live, work, pleasure, beauty and more give food for thought as Gibran explores themes that everyone can relate to – regardless of their beliefs or lack thereof. There are many books that are described as being must-reads, but this is most definitely one of them, thanks in part to the number of ways in which it can be read. You can break through multiple layers of narrative and theming to start your own philosophical journey, and it's likely that you'll be recommending the book to friends and family before you've even finished it. Truly heartwarming stuff. If you're a fan of Dan Brown's mysteries, you're going to enjoy Murray Bailey's Map of the Dead. This time around, the action is set in Egypt, and there's close attention to detail when setting the scene as you join Alex MacLure as he tries to maker sense of a coded message left for him by his murdered colleague. With a passion for the times of the pharaohs, Bailey's writing skips cinematically between modern and ancient Egypt, and his interest in mathematics is used to great effect throughout the book. There's a very Brownian emphasis on puzzles, and it's clear that a huge amount of research has been carried out here. As well as being a highly enjoyable read, readers are taken on a testing journey as they are challenged to decipher clues and riddles along the way.